Lebanese cuisine (Arabic: المطبخ اللبناني‎‎) (French: cuisine libanaise) is a Mediterranean cuisine. It includes an abundance of whole grains, fruits, vegetables, starches, fresh fish and seafood; animal fats are consumed sparingly. Poultry is eaten more often than red meat. It also includes copious amounts of garlic and olive oil, often seasoned by lemon juice. Olive oil, herbs, garlic and lemon are typical flavours found in the Lebanese diet. Instead of cooking with fatty butter or cream, vegetable oil is used and olive oil is used generously in salads. While olive oil is still high in fat content, it is full of mono-unsaturated fatty acids which can lower cholesterol and improve heart health. Olive oil can also help control blood clotting and blood sugar levels. When eating a Lebanese diet, fresh veggies, fruit and legumes are usually consumed in a much greater quantity compared to meats and high-fat dairy ingredients. Even high-starch carbohydrates are not very common in this class of cuisine. Small amounts of rice and lentils are more common than white bread, noodles, or potatoes. 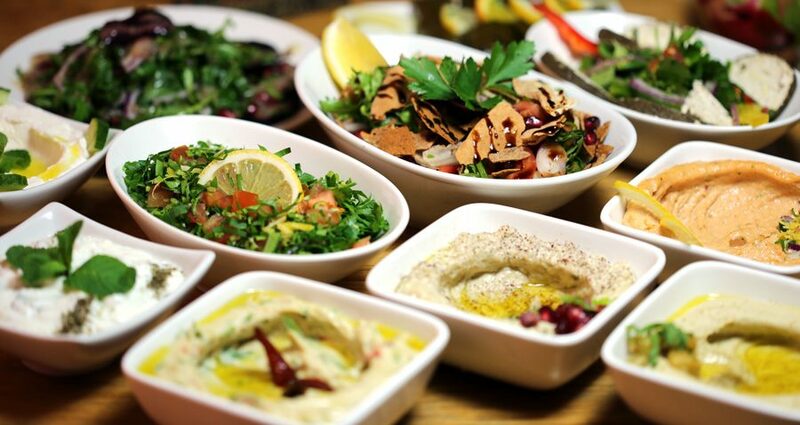 You only have to look at the wide variety of mezze (small dishes) there are (estimated at over 170 different types) to see that over 50% are vegetarian or vegan. Lebanese food is extremely tasty (see Why is Lebanese Food so Amazing) and appreciated by the palette because of the variety of spices and fresh herbs (see An Introduction to Lebanese Cuisine) that are included in so many of the recipes. For example, parsley used in the traditional dish, Tabouli (we say Tabbouleh at Meejana), aids digestion and provides a crisp, green flavour. Parsley is also high in antioxidants and an incredible amount of vitamin K (which plays a key role in bone health and protects the brain fro neural damage). Mint is a common herb found in Lebanese dishes, and while this plant may seem like it is just a garnish or an aid to freshen your breath, it is actually helpful with digestion and full of carotenes and vitamin C.
The traditional sauce, Tahini, is made from sesame seeds, which have the highest oil content of any seed, also can enhance a dish with its rich, nutty flavor. Sesame seeds, and therefore tahini, are rich in Omega 6 fatty acids as well as protein. Tahini is also a good source of copper, methionine, calcium and manganese. The use of lentils in Lebanese cuisine also contributes to the health benefits of this type of food. Lentils are easy to cook with because they easily absorb the flavours of the other ingredients in the dish, and take well to seasoning. Lentils are high in fibre, protein, and B vitamins. Plus they have almost no fat content at all and are relatively low in calories. Lemon stars as an important ingredient is several traditional Lebanese dishes. It is used in the preparation of hummus, tabbouleh, stuffed grape leaves (warak enab), and moutabbal (see Is it Moutabbal or Baba Ghanoush), among others. Lemon is full of potassium. It has antiseptic and antibacterial properties which helps keep food fresh and keep your insides free from infection. Getting a daily dose of lemon can aid constipation and inflammation. Adding lemon to your diet is also an aid in weight loss and a booster for your immune system. Garlic is also a cornerstone of Lebanese cuisine and it’s a great little spice to have on your side. Garlic has a long history of use as an infection fighter – against viruses, bacteria and fungi. Modern research also highlights garlic’s potential to reduce the risk of heart disease, cholesterol levels and cancer. It is an excellent source of vitamin B6 (pyridoxine). It is also a very good source of manganese, selenium and vitamin C. In addition, garlic is a good source of other minerals, including phosphorous, calcium, potassium, iron and copper. At Meejana, we have drawn together a diverse menu based on the regions of the country to curate a menu based on tradition and freshness, along with a few secret family recipes like our signature 12-spiced chicken. The interior of Lebanon – in the mountains – is more known for its meats, usually lamb or goat, while the coastal areas are more famous for their seafood. Some dishes are famous across the country, like the tabbouleh, hummus, moutabbal and falafel and have gained wide international acclaim. Other dishes like Kibbeh (a lamb and cracked wheat shell stuffed with minced lamb and pine nuts) can be found everywhere but the recipe and presentation differs from town to town. A touch of cumin here, a pomegranate there. One bakes it like a meatloaf, another makes huge balls with a touch of fat from the sheep’s tail, another strips, another delicate canapés. There are even vegetarian versions of Kibbeh which may be stuffed with spinach or made with pumpkin. It is a truly versatile, varied and healthy cuisine. Visit us in Weybridge or London to explore one of the widest Lebanese menus in the UK.